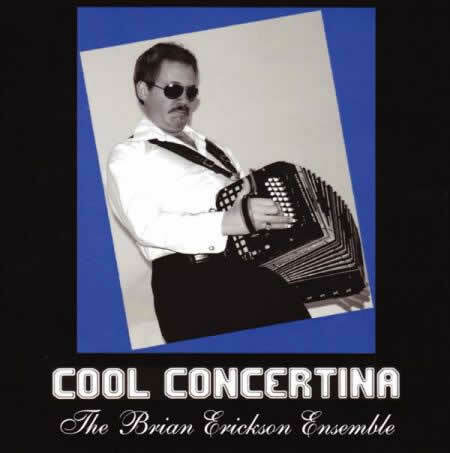 JAZZ on the CONCERTINA?… How unusual … and when the concertina is in the hands of jazz artist, Brian Erickson … How wonderful! … How exciting! … How swinging! Brian Erickson was born and raised in Wisconsin Rapids, Wisconsin, USA. At the urging of his parents and grandparents (especially his grandfather Ole) … he picked up the concertina at age nine and by eleven was already entertaining at local clubs and events. Always practicing and desiring more knowledge, Brian started studying music theory a few years later with the famous jazz clarinet virtuoso/music Professor Don Chesebro. It was during these early years in Brian’s musical career that he was introduced to the world-famous jazz accordion legend Art Van Damme. Art and Brian have been great friends ever since (as well as having tremendous mutual respect and admiration for each other's talent!!) But even before meeting Art; Brian became so taken by the superbly swinging sounds of Art Van Damme (via recordings), that he immediately set out to play jazz on the Chemnitzer System Concertina. Through the early years and up until today, Brian has performed throughout the world (USA, Canada, and Europe) at numerous clubs, festivals, jazz and accordion venues. He is considered by the most revered authorities in international accordion/concertina “squeezebox” circles to be The World’s finest Concertina Player …. He certainly is at the very least one of the world’s finest concertina players … but more importantly Brian’s greatest contribution is that he is indeed The World’s one and only jazz concertina player/expert … he invented jazz concertina (or at least invented this superior level he brought it to.) The Chemnitzer concertina has long been popular in the polka bands of the Mid-Western and Eastern USA. There are many great concertina players in that scene. However … all of them are basically ethnic/polka players … When Brian Erickson plays the concertina … the concertina becomes something different … it has a different sound in his hands … it becomes a swinging, wailing jazz vehicle! It is because of Brian’s inspiration of his friend Art Van Damme, Brian’s exceptional talent on the concertina, his amazing use of bellow control, and his innate “feel” for jazz that the Chemnitzer concertina has been taken to this new and exceptional level!!! More than a mere musician … Brian Erickson is an artist, musician, arranger, pioneer, and innovator!!! Although the Chemnitzer concertina is a musically flawed system (illogical keyboard layout). There are still many, many “tricks” to be gathered out of it … This has become one of Brian’s jobs! Brian Erickson’s “tricks” include “single-row slides” (glissandos), “double-row slides” (glissandos), “entire-keyboard slides” (glissandos), “semi-tone bellow shakes”, “multi-tone” (chord) bellow shakes, etc, etc … These are just some of Brian’s many inventions!!! Brian created these tricks which meant he knows “how” and “where” to “make-them-work” ….his creativity knows no boundaries! BRIAN ERICKSON IS TO THE CONCERTINA … WHAT ART VAN DAMME IS TO THE ACCORDION!!! !